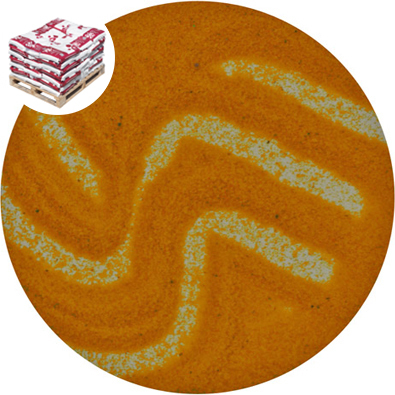 Fine orange coloured sand, colourfast, non-staining and suitable for use with water. Suitable for urban recreation, art installations and staging. 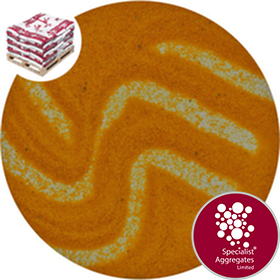 Orange coloured sand manufactured by Specialist Aggregates in the UK using non toxic organic pigments and resins. This river-worn sand has been specifically chosen and graded to ensure that harsh "gritty bits" and dust are removed, allowing our clients to specify and use with confidence for pop-up urban recreation, art installations, and event staging. 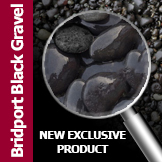 Design Specify: Orange recreation sand from Specialist Aggregates.